While in the rest of the United States of America, college football fans are most likely discussing which team they like to win the national championship this time around, talk is of a new coach here in Syracuse, N.Y. Exciting championship games this past weekend and the last meeting of the BCS committee came up with the New Year’s Eve semifinal matchups of No. 1 Clemson vs. No. 4 Oklahoma and No. 2 Alabama vs. No. 3 Michigan State. May the fans of the Tigers, Sooners, Crimson Tide and Spartans rejoice and fret and speculate. And, by the way, the rest of you out there whose teams came oh-so-close to making that extremely elite final four, don’t you wish it was a field of eight? Don’t you hold a grudge against the selectors? I hope you still can find some solace in your bowl game to come. May all of you whose squads won enough games to play one more contest appreciate that game with a sponsor’s title in front of it. In Syracuse today, fans were watching something else entirely. Or listening, somehow, if they couldn’t get in front of a TV or screen. 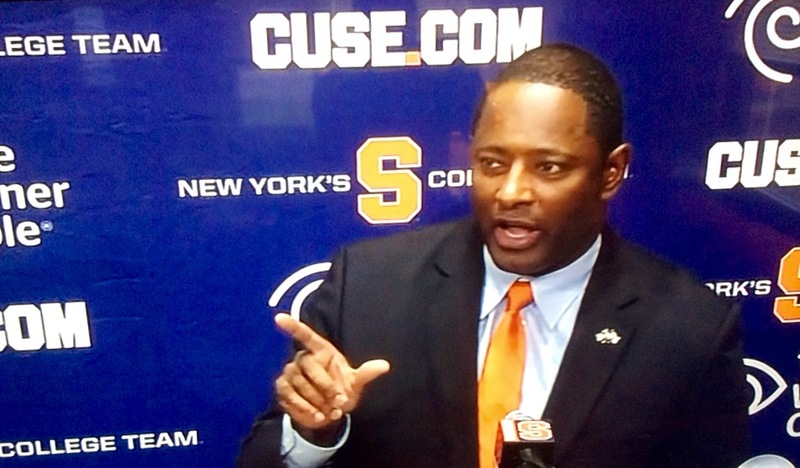 The new Syracuse football coach, Dino Babers, makes a point. There’s enough interest in the Orange program, still, after two 3-9 seasons in a row, for the local stations to program live the introductory news conference for new Syracuse University football coach Dino Babers. I wrote about how I took what the former coach at Bowling Green had to say for my Mark It Up community column for Syracuse Public Media site WAER.com. The man made a good first impression. Which team is your pick to win the national football championship? Is there a bowl game that’s caught your eye, and if so, why? Who is your favorite coach, and why? Good luck to him and to the Orange. It’s going to take a lot of hard work. Thanks, Scott. Mizzou hired a new coach too. Very hohum hiring, in my opinion, but what do I know. I think people will miss Pinkel more than they realize. He really did the best job any man could have with what he was given. The program was mostly solid during his years. The current state of Mizzou athletics is pretty pfffffffffffft!!!!!! Hope you’re doing well, Mark. Hi, Don! Great to see you, my friend. I think Pinkel was great for Mizzou. I hope he can overcome his illness. That’s more important than the football thing. Have a great holiday over there in St. Louis, DOAT family! Things can’t get any worse with the football team can they? I think they’re looking up starting right now, Skippah! I love the job Harbaugh did in his first year back at the alma mater, Beth. I think my Terps stole your defensive coordinator, a smart young Durkin! Great move! Yes, eight would be exciting, but kind of long as well … I see both sides of it.